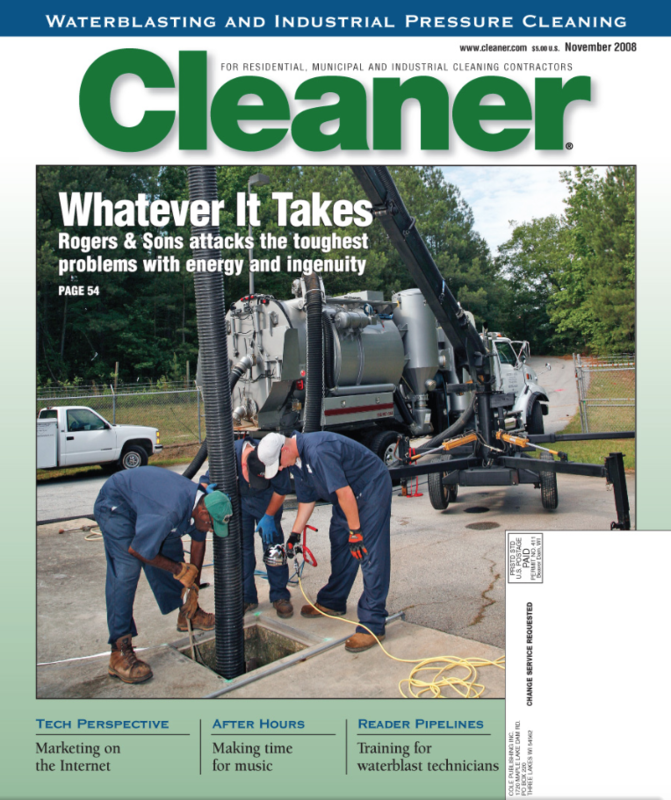 Rogers & Sons was celebrating 40 years in business when it was last featured in Cleaner magazine in 2008. A decade later, here’s where the company stands at age 50. Cloyd Mason Rogers Jr. works a job for DeKalb County, one of the company's oldest customers. Although Cloyd Mason Rogers Jr. lives in the tiny Georgia town of Lithonia (less than a square mile with a population under 2,000), he has a big marketplace to find work in. “We’re just a dot on the map, but we’re next to the Atlanta metropolitan area that’s home to nearly 6 million people,” says the owner of Rogers & Sons. But that’s not to say there haven’t still been some struggles in the 10 years since the small firm was last featured in Cleaner magazine in November 2008. “When you all did the article back then, we were rolling real good, doing a good bit of work and all. Then along came 2010-11, and the economy started going up and down, which caused our business to take the same crazy, unpredictable ups and downs too,” Rogers says. Add some domestic problems to the work problems, and bankruptcy loomed. Introspection and refocusing stabilized everything. Although never a large company, Rogers downsized even further to his current office staff (sister Mary Evelyn) with himself as the lead service tech aided by a part-time employee for bigger jobs. “We hardly do domestic septic work anymore,” he says of his mission change. “Residential jobs are still part of our workload, but our bread and butter is the commercial side, municipalities — like my oldest customer, DeKalb County (population 700,000), that has been a client since the early 1980s. Cloyd Mason Rogers Jr. still occasionally builds or modifies equipment to suit his purposes, such as this crawler used to clear sewer easements. In the original 2008 profile, Rogers was lauded for inventing or modifying a lot of his industrial cleaning tools because he couldn’t find the equipment he needed. He modified root cutters so they would demolish concrete and used his ingenuity to create his own jetting nozzles and custom filters. He still does some of that, but he relies more on nearby businesses that already manufacture the necessities. “You need to step back on what you’ve got to build and the headaches you’ll encounter trying to figure out which way is best for what you have to do. Time is money, and I need to spend my waking hours on the job, rather than in the shop making my own parts and tools,” Rogers says. Rogers & Sons was last featured in the magazine in November 2008. He’s watched the industry change over the years. Rogers does little in the way of formal advertising.